Topic: Thirty three and a third. Re: Thirty three and a third. Both your meal and your LPs sound lovely! Are the albums new to you or are those some of the ones that you cleaned and are now listening to? By the way, what kind of record cleaning machine does your dealer have? A couple years ago, I had them tune the suspension on my Oracle Delphi, install a new cartridge and overhaul my Audible Illusions tube pre-amp with all new tubes. They also have a deal whereby, if you buy cleaning fluid, you can come in and use the machines any time you want. Nice deal. It's also good business, as it keeps people coming back in. I flat out do not need any more equipment now, but every time I visit, I try to buy something, even if it's just an LP. Anyway, they have a few machines. I have used the Keith Monks machine a few times before, but now I prefer the ClearAudio (don't know the model). Both retail for about $6000, which is waaaaaaaaaay more than I'd ever pay for something like this. Nevertheless, it is great to be able to use them for free. If I had to buy a machine, I'd just go for the basic VPI--absolutely bullet-proof and very functional at about a tenth of the price. There really is no need for such a deluxe maching unless you're cleaning thousands of records a year--or you are filthy rich with money to burn. ANyway, every time I visit, my records I'm cleaning are a combination of about half new ones I've bought in local shops or online, and half old ones I've had sitting on my shelves, sadly neglected for 2+ decades! Nice to dust them off for a listen! Do you have access to a cleaning machine? Any interesting new finds? Sounds like a neat shop! Really nice that you can clean your LPs there--and using such nice RCMs too. A few years ago, I purchased an Okki Nokki. https://www.okkinokki.com If you scroll down the page, you'll see a photo of two metal RCMs; I have the black one. Reminds me that I need to contact my guy at the audio store to order some new pads for the brushes. I just have the arm that is designed to clean 33 1/3 LPs. They also make ones designed to clean different sized records too. Works pretty nicely. And, lastly, The Eurythmic's "Be Yourself Tonight"
CRD is a fairly recent discovery. Leaving the core repertoire to the majors and concentrating on instrumental and chamber I am most impressed by this label. Through the 1970's in analogue, the production values are first class (all sleeves gatefold). Mostly recorded in churches scattered around the London area all I have so far collected are by Bob Auger as sound engineer. 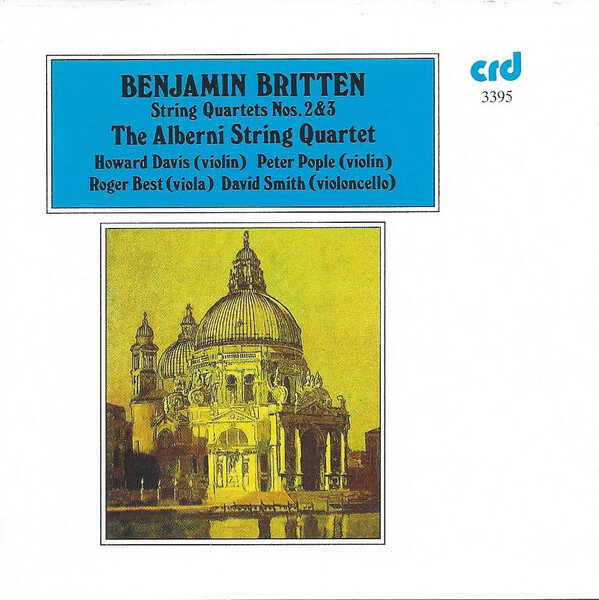 As often the case in both the Britten and Fauré below I already own recordings made by main-stream labels but prefer for both sound and performance the same work from CRD. My focus is analogue, so although I understand they are currently in business I cannot comment how CRD perform today. I believe that I have one or two of CRD's CDs (will have a go through them later) but don't recall having any of their LPs. Will certainly keep an eye out for the LPs! Any duds? Or particular favorites that you've run across? Hello, P. Where have you been hiding! In a flurry of excitement I purchased in one go four LPs which are a part of the complete piano music of Granados by Thomas Rajna on CRD. I normally love Spanish music but for some reason this set (or music) does not work for me. I recall you are an admirer of The Nash Ensemble so this would be perfect for you. The Trio is my favourite Fauré work. I have a small number of those gatefold CRD albums and I have always liked their content and presentation. Yes, only a small company so there are not masses of LPs (or CDs) out there, but you have to admire the single mindedness of the label in content and presentation. I notice there are some omissions from the LP era. The most glaring I will post on "Listening now thread". And, yes, you did rightly recall; I am indeed an admirer of the Nash Ensemble. And I do also love Fauré! Which ones do you own Aligreto? And thanks Irons for that link. I'll check it out later today. Blimey, P, you are adept at this double quoting. I have not worked it out myself. Hey, I had to make a correction to mine after I had posted it, so don't feel badly! A kind poster here told me how to do it; you go to the second posting of a person whose posting you wish to quote and click on the quote button for that one. Note: make sure that before you do that, you have your cursor in the place where you wish the second quote to go in your new posting. You can then delete any irrelevant parts of the quote. After doing that, again, move your cursor down past the end of the second quote to type your reply. Give it a try Irons. I will have to check my vinyl collection but Fauré does come to mind immediately along with Ravel.